This is a study in the pathology of cultural criticism. By analyzing the thought and influence of three leading critics of modern Germany, this study will demonstrate the dangers and dilemmas of a particular type of cultural despair. Lagarde, Langbehn, and Moeller van den Bruck-their active lives spanning the years from the middle of the past century to the threshold of Hitler's Third Reich-attacked, often incisively and justly, the deficiencies of German culture and the German spirit. 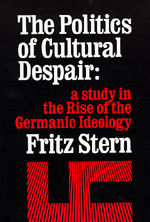 But they were more than the critics of Germany's cultural crisis; they were its symptoms and victims as well. Unable to endure the ills which they diagnosed and which they had experienced in their own lives, they sought to become prophets who would point the way to a national rebirth. Hence, they propounded all manner of reforms, ruthless and idealistic, nationalistic and utopian. It was this leap from despair to utopia across all existing reality that gave their thought its fantastic quality. Fritz Richard Stern is an American historian of German history, Jewish history, and historiography. He is a University Professor Emeritus and a former provost at New York's Columbia University.